Even now, in an era when few TV watchers can agree on much of anything, there are a small number of universally praised marvels. There’s The Good Place. There’s Laura Dern. There’s the moment when the dragons showed to save Jon Snow on Game of Thrones. There are the hot dads of Riverdale. And there is Rita Moreno on One Day at a Time. Moreno’s Lydia is a marvel of comedic timing and dramatic flair, and she walks away with every scene she’s in. It’s almost unfair to Justina Machado, whose performance as Lydia’s daughter is also astoundingly great. But Machado’s work is the tireless and often less flashy backbone of the series; Moreno pulls focus as easily as she breathes. Lydia stalks in and out of the Alvarez family’s apartment like she’s entering a Broadway theater. Even the set is designed to help: There’s a curtain dividing Lydia’s room from the rest of the apartment, and every time the curtain opens, our minds frame the space as a stage with Moreno as the featured performer. Over the course of the second season, she dances, she destroys another woman’s lipstick, she yells, she smokes a cigar on a balcony, and she says the words “Vicks VapoRub” in way that turns them into the funniest punch line on TV. At one point, she does a small bit with an extendable grabbing claw that made me laugh so hard I wept. The miracle of One Day at a Time’s second season is not just about Moreno’s performance, though. (Nor is it just about Machado, or any other of the strong performances on the series.) It’s about the way One Day at a Time combines Moreno’s potent performance with the stories it wants to tell. The power comes out of the way One Day at a Time positions Moreno inside of some of its most controversial, culturally fraught subjects. It’s not just that she’s great; it’s that One Day at a Time uses her greatness in service of its most radical storytelling. Like its original iteration, the reboot of One Day at a Time takes on many of our biggest cultural third rails. Machado’s Penelope goes off of her meds and slips into a depressive state that makes her nearly suicidal. Penelope’s daughter Elena happily introduces all her friends, including their names and their preferred pronouns, which leads the rest of her family to wonder dizzily about the distinction between her, their, and zir. Elena also has to confront her father, Victor, about his intolerance of her sexuality, and a flashback episode finds Penelope and her then-husband debating whether to reenlist in the military immediately after 9/11. Throughout its run, and for nearly all of its characters, One Day at a Time is relentlessly of-the-moment. But many of those intense issues are built into the series as neatly contained stories. Penelope’s anxiety and depression story line is immensely moving, and it’s unusually direct about the patterns of depressed thinking, especially for a show with One Day at a Time’s comedic veneer. Almost all of that story is contained within a single episode, though: Penelope spirals and seeks help, and then the status quo returns. Meanwhile, Elena’s sexuality is an ongoing thread of the season, but with the exception of the beautiful scene between her and Victor, it’s often treated as a humorous subplot. Season one gave the major arc to Elena understanding herself and trying to make her family understand; now, that story is more of a humming background premise than an ongoing source of tension. I don’t want to underplay the importance of Elena’s identity and her relationship with a new girlfriend, nor do I want to suggest that there aren’t plenty of people out there who would watch Penelope sink into a depression and say that she should be able to snap herself out of it. These issues are loaded. They’re topical. They’re political, and it’s fantastic to see a show tell these stories in such a compassionate, thoughtful way. But for the most part, One Day at a Time does not present them as debatable questions. It’s a foregone conclusion that Penelope’s depression needs treatment, and that Elena’s father is in the wrong. This in itself is a political act: Lydia, who previously disavowed the necessity of anti-anxiety meds, now readily accepts that Penelope needs them. One Day at a Time will not waste any more of its time on that viewpoint. The same is true of Elena’s father, who admits he was in the wrong. Now, in season two, the issues that One Day at a Time allow to be truly combustible, the ones that form an arc from the beginning of the season until the end, are the ones that fall on Lydia. Specifically, Lydia being a noncitizen who speaks about citizenship, voting, and the American dream. Just as in they are in Congress right now, the most volatile issues from season two are Donald Trump, immigration, and participatory democracy — and in every case, Rita Moreno’s Lydia is the linchpin. Elena is furious when Lydia announces that she doesn’t vote and doesn’t particularly want to. “And now that monster’s in the White House!” she yells, to which Lydia retorts, “Don’t blame me, I didn’t vote for him!” When it comes out that Lydia doesn’t vote because she’s not an American citizen, Elena is relieved; Lydia has a green card, so she can apply for citizenship and become a participating member of the democracy. Except Lydia doesn’t want to. She loves living in the United States, but she doesn’t want to give up her Cuban roots. She loves that America is a democratic country, but she doesn’t feel a need to participate herself. At a moment when immigration is the most emotional, pressing issue on the national stage, strapping it to a genial family sitcom feels like wrapping a bomb inside a cozy blanket. But it works because One Day at a Time pours all of that controversial combustibility into Moreno’s performance and Lydia’s character. She’s so undeniably funny, so absolutely self-assured and loving and confident in who she is, that the threat of such an unwieldy, painful subject never craters the episode or the season’s bigger goals. There are some clear parallels between Lydia and Archie Bunker, another Norman Lear character who was constantly given explosive topics and sent out into the story to both ignite and contain the inevitable blast. In both cases, the actor’s performance is crucial to the success of the storytelling strategy. On All in the Family, Carroll O’Connor’s Archie was loud, blustery, and perpetually furious, and his reactive anger was on such a hair-trigger that any premise of an episode could wind him up, set him railing against the topic du jour, and let his own hysteria be the proof of his absurdity. Now, in 2018, I wonder if an Archie Bunker and his inevitable MAGA hat would cut too close to our political iconography. The narrative bomb would go off, but all we’d be able to see is the fire of our own feelings, preventing the story from moving forward in any meaningful way. So One Day at a Time performs that same storytelling feat in another way, and with an entirely different kind of older family member. 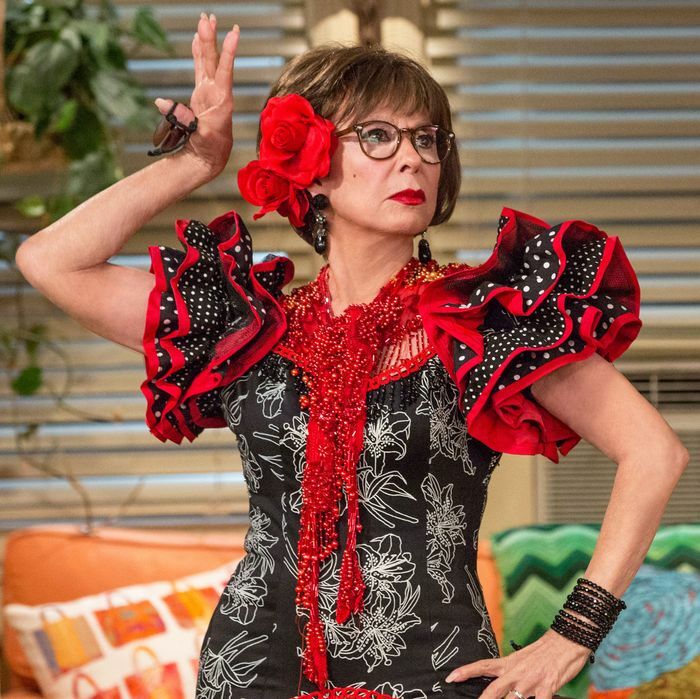 Rather than O’Connor’s bullying wrath, One Day at a Time wraps its hot-button grenade in Rita Moreno’s deliciously melodramatic self-confidence, in a performance that slides between poignancy and silliness and warmth so readily that you can hardly tell the moment when one mode drifts into another. Lydia is wrong pretty often, not unlike O’Connor’s Bunker — she can’t understand why Penelope needs to go to therapy, she doesn’t think voting matters, and she can’t recognize the relative privilege of having a green card — but she listens. Although she doesn’t defuse the narrative bombs, she neutralizes them with the glorious, distracting, dancing spectacle of her own personality. She is a one-woman, humor-driven diversion machine, so charming and self-assured that when you finally recognize an episode’s immense and fraught message, you’re already won to her side. Moreno’s performance allows the show to avert the precious vibes of a Very Special Episode, and the story sails along on the giddy currents of Lydia’s personality rather than its own hot air. One Day at a Time is a fantastic show, and all of its actors are crucial to what makes it tick. But Moreno’s performance as Lydia is what lets the show feel so vital and heartbreaking on the most contentious cultural touch points, while still guaranteeing the audience will hang on for the ride.